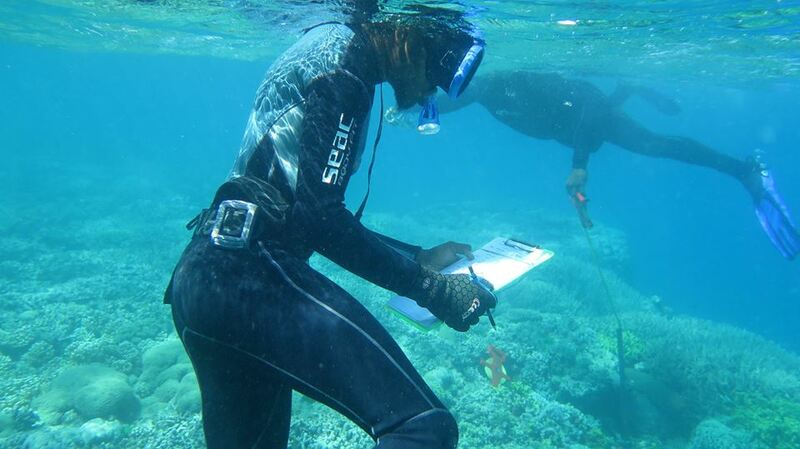 The Torres Strait Regional Authority’s (TSRA) Land and Sea Management Programme have recently undertaken surveys in established coral monitoring sites around Poruma, Masig, Erub, Ugar and Mer in the central and eastern Torres Strait. The permanent survey sites have been monitored twice since they were established in April 2015, with aims to record changes in coral reef health and identify the causes of change. The surveys are a continuation of an Australian Institute of Marine Science (AIMS) led project that developed a long term coral reef monitoring strategy for the Torres Strait in collaboration with the TSRA, the Great Barrier Reef Marine Park Authority (GBRMPA) and the Commonwealth Scientific and Industrial Research Organisation (CSIRO). The TSRA Chairman, Mr Joseph Elu, said TSRA Rangers from Erub, Warraber, Mer and Boigu spent two days at each site completing the underwater surveys. “The surveys recorded healthy coral cover with low levels of coral bleaching, small numbers of the coral predator Crown-of-Thorns Starfish and a low incidence rate of coral disease at each island,” Mr Elu said. “The Australian Bureau of Meteorology is predicting a strong El Niño event this wet season, which may result in increased water temperatures across the Torres Strait, increasing the potential for a mass coral bleaching event. Mr Elu said that healthy coral reefs are vital to the Torres Strait Islanders way of life. “We need to increase our knowledge and understanding of what pressures are impacting our coral reefs for the benefit of future generations,” Mr Elu said. “This is the first time that the TSRA Environmental Management Programme has conducted technical surveys of this nature without the assistance of scientists. It’s very encouraging to see these skills develop and we all look forward to seeing the results of the coral monitoring project.